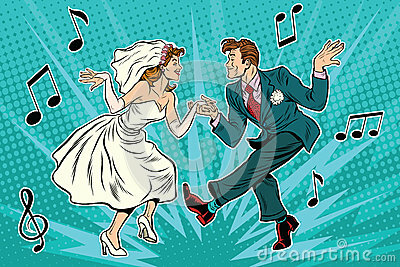 Wedding invitation cards with a floral pattern and a cute colorful illustration of a dancing couple in cartoon style. Invitation, wedding card or other printed products. Groom and bride wedding day, in dress and suit vector illustration. Young wedding couple. Dancing at the wedding. Couple in love. A man in a black suit and a woman in a white dress are dancing. Round frame.